Musa acuminata/ Musa sapientum, known as Mai`a in Hawaiian, usually grows in moist areas that are either wind protected, planted around dwellings, or on well-watered banks of taro lo`i. It can grow on median forest belts from an altitude of 1500 to 3000 ft. and on lower fringes of the forests. The flowers develop into simple fleshy fruits with little or no seeds at all. Generally the banana is seedless (parthenocarpic fruit). The Polynesians who came to settle in Hawaii brought bananas with them. 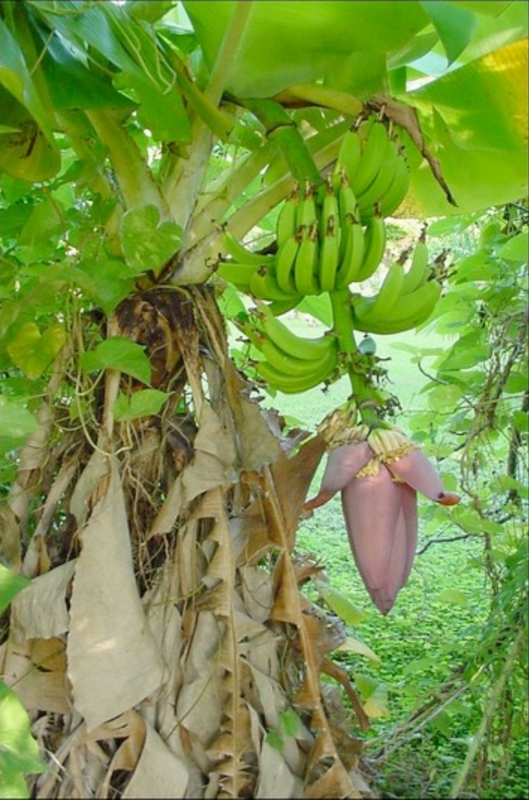 Although we think of the banana tree especially as a food plant, the Hawaiians used the banana for a medicine, too. They used different kinds for different diseases. The juice or sap from the cut flower bud was used when a person had a weakness of the body and a coated tongue from stomach trouble. The flower bud was also pounded with other things, and the juice squeezed out and strained. This liquid helped get rid of stomach cramps. Boiled ripe banana fruits were mashed and added to other ground-up plants — then mixed with water and finally strained. This liquid was used for constipation. The ripe fruit was also used for asthma. When a baby was weakly, the mother pinched off the tip of the flower bud and gave the drops of sap or juice that dripped out to the baby. Now we have learned that this sap is rich in vitamins!